Adam Caplan began practicing yoga in high school as a means of improving flexibility to enhance athletic performance. What started out as an experiment with a supplemental stretching routine eventually evolved into a conscious quest for Truth. Motivated by the feeling that “there is something more out there,” Adam studied and practiced many different styles of yoga and a variety of different types of meditation. He explored some of the world’s religions and mystical traditions academically, and studied Buddhism and meditation while living in a monastery in Bodh Gaya, India. Adam has sat many meditation retreats (Vipassana, Zen, and Hridaya, among other meditation styles) in India, in Thailand, and in his home country, the United States of America. He has also studied Tae Kwan Do, and healing traditions such as Alexander Technique, Reiki, and Thai massage. 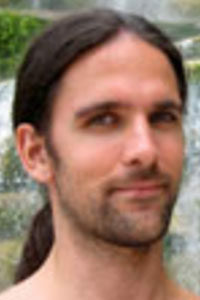 Adam became certified to teach Kripalu Yoga in 2005 and Agama Yoga in 2009. From his very first Revelation of the Spiritual Heart retreat in 2008, Adam has loved the way Hridaya Yoga integrates in a coherent way many of the traditions he has studied and practiced. Adam appreciates how Hridaya Yoga continues to challenge his propensity for approaching life with the intellect by giving him the tools to live from the space of the heart. The increased balance between these two paths brings more harmony and happiness to his life. Hridaya Yoga has also helped Adam to bring more joy to his daily practice, more centeredness to his being, and more ease, more grace, and more awareness into all aspects of his life. Since completing the Hridaya Meditation and Hatha Yoga Teacher Training Course in 2011, Adam has been excited to be sharing such a deeply meditative, profound, and meaningful style with others. Adam would like to express gratitude to all of his teachers, and especially to Sahajananda for his presence and his light, and for the beautiful gift of Hridaya Yoga.